Israeli Prime Minister Benjamin Netanyahu paid a rare, secret visit to Egypt in May for talks with President Abdel Fattah al-Sisi on a ceasefire in the Gaza Strip, Israeli television reported Monday. There was no immediate confirmation of the visit from official sources, but the private Channel 10 station said the leaders met on May 22. That followed a day of huge protests on May 14 along the Gaza border against the opening of the US embassy in Jerusalem, sparking clashes which left 63 Palestinians dead. Gaza lies between Israel and Egypt, which has previously mediated between Netanyahu's government and the Islamist Hamas movement that controls the coastal enclave. [post_ads]According to American sources quoted by Channel 10, Netanyahu and Sisi discussed the possibility of a long-term truce in the Strip, where Israel has since 2008 fought three wars with Hamas. The Islamists seized power in the territory after a virtual civil war with the Fatah movement of Palestinian president Mahmud Abbas, and Gaza has been under a crushing Israeli blockade for a decade. 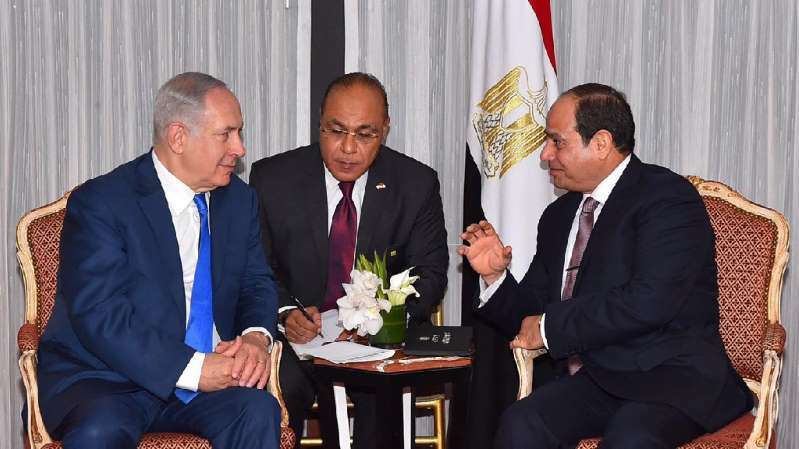 Netanyahu and Sisi also examined the possible return of the Palestinian Authority to the territory, an easing of Israel's blockade and reconstruction of Gaza's war-scarred infrastructure, the report said. The Egyptian presidency was not immediately available to comment on the Channel 10 report. Gaza has seen mass protests since the end of March as Palestinians demand the right to return to homes their families fled or were expelled from in 1948 during the war surrounding the creation of Israel. Israeli Defence Minister Avigdor Lieberman said Monday that another round of fighting between Israel and Palestinian militants in Gaza was inevitable, despite attempts to reach a long-term truce. There have also been three major military flare-ups between Israel and Hamas since July, on top of the months of tension along the border. At least 169 Palestinians have been killed by Israeli fire since March 30, mostly during clashes sparked by demonstrations. There have been efforts by United Nations officials and Egypt to secure a long-term truce between Israel and Hamas, though Israeli officials have not commented on them. A fragile truce came into effect Thursday night, mediated by Egypt and the UN, according to a source close to the negotiations.